CarbonCast Surface Area 19,200 sq. ft.
Budget was one of the driving factors. 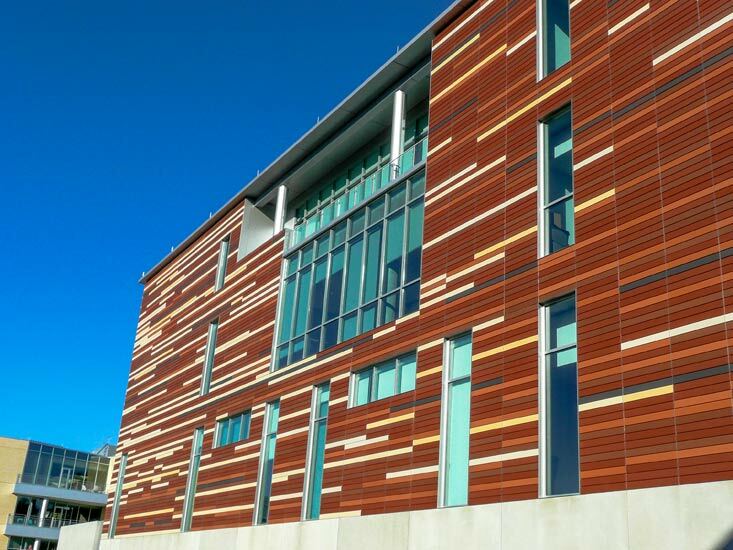 Cladding was originally conceived as a conventional rain screen system with a steel frame and an air barrier. 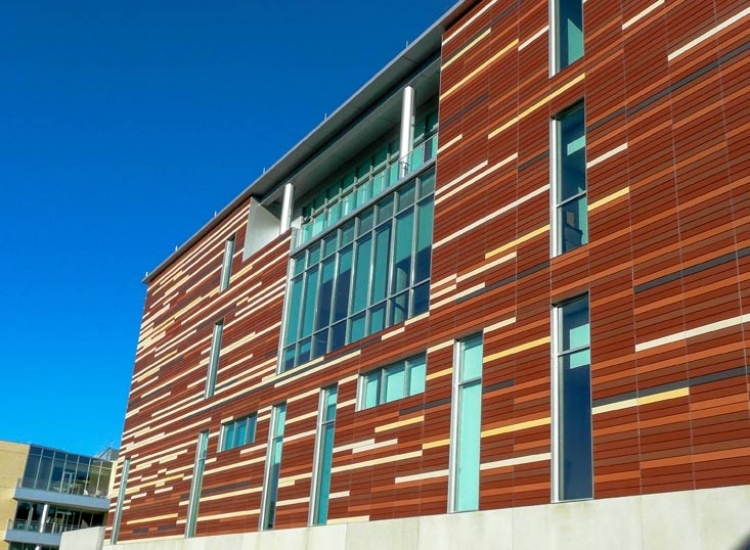 A comprehensive cost analysis by the general contractor concluded that in this application a traditional rain screen would cost considerably more than terra cotta clad into an insulated precast sandwich panel. The precast system maintained a similar appearance, while yielding notable cost savings (over 25%). A five-color, random blend terra cotta tile pattern was installed in the precast production facility, and the precast provided an excellent rain barrier. Carefully recessing the precast joints concealed them in a way to give the illusion of a traditional rain screen. Extensive coordination between the architect, contractor, and precaster yielded impressive end results. 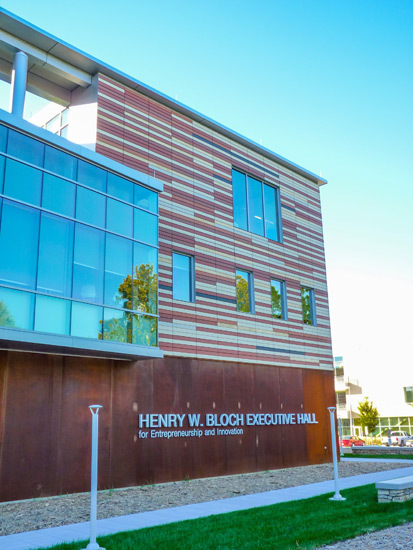 In addition to thermal performance, high-performance integrated design, LEED energy points and overall goals of sustainability / environmental stewardship goal, the overall aesthetics of the job were of the utmost importance. 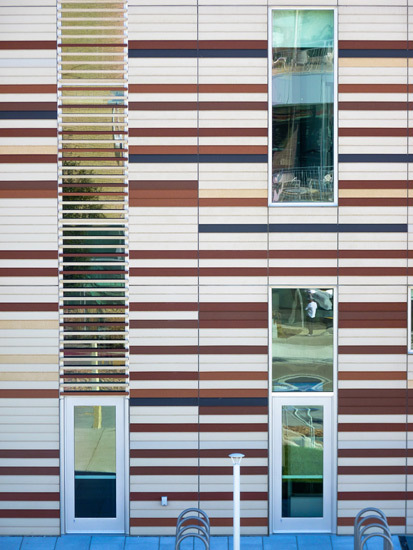 Striking the balance between providing an innovative, contemporary structure while also respecting and maintaining this University’s image of a being a masonry kind of campus was key. The modular appearance of the five-color terra cotta pattern was the solution to keeping that masonry palate, but doing it in a new way. While a seemingly random pattern was applied, the design architect took an ambitious, hands-on approach by laying out each color of the 6” x 4’-0” terra cotta tiles. The precaster used color-coated instructions in the production facility to carefully place each individual piece of tile as directed. Meticulous use of sealants kept the grey precast out of view, leaving the joint as a shadow (similar to a conventional rain screen). 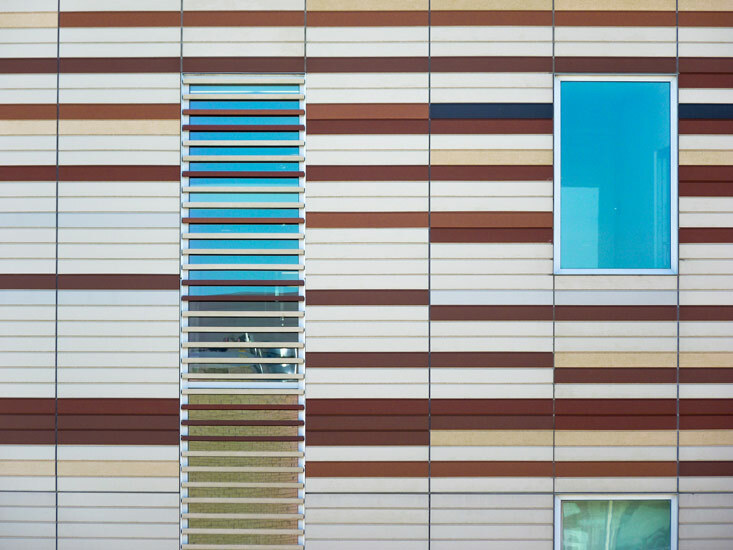 The terra cotta pattern was a darker concentration of colors on two sides of the building (to complement the individual adjacent masonry buildings on each respective side of the campus). The darker concentration of colors subtlety conveyed the appearance of a shadow on the two darker sides. 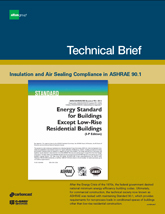 Continuous insulation was provided (edge to edge, top to bottom) to meet ASHRE requirements. The CarbonCast was used to connect the concrete wythes, meeting the needs of a low thermal transfer system and helping with thermal mass goals. The 4-3-4 panels with extruded polystyrene (XPS) achieved an R-Value range of 16.37 to 17.65. This is based on the fact that XPS has an R-Value of 5.0 at 75 degrees F and 5.4 @ 40 degrees F. The mechanical system’s radiant heating ultimately ended up being located under floor. 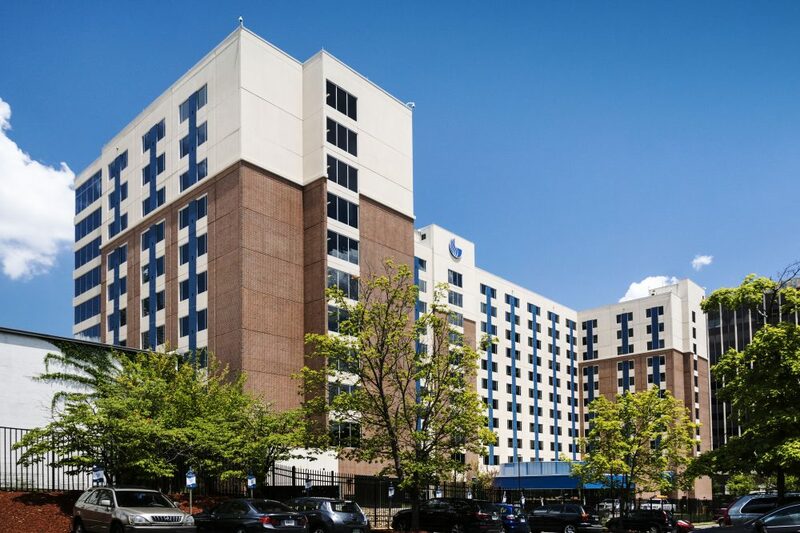 “Once the building became thermally stable, it allowed us to bridge the budgetary objective together in one solution,” noted the project architect’s material specialist who served as one of the principals in charge. Many of the challenges were on the precaster’s side. 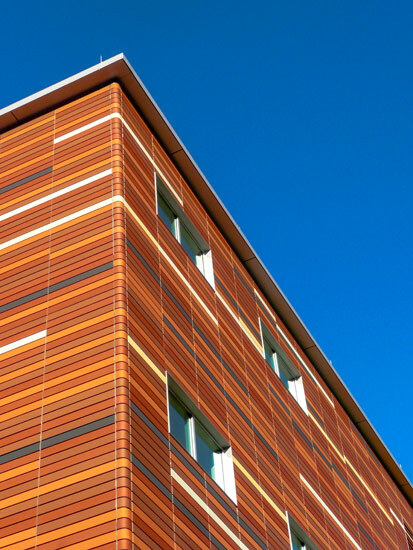 They worked to develop a comfort level with using the terra cotta in an insulated panel. In doing this, they did extensive research. Everything was explored from: the coefficient of thermal expansion, to the amount of precast bowing that could happen prior to the terra cotta tiles cracking, optimum thickness of the tile, freeze-thaw cycles, etc. To the credit of the terra cotta company, when the available data was deemed to be incomplete or insufficient, the tile company did additional testing, giving the full team that comfort level to move forward. Full precast mock-up panels were also designed and poured prior to the project going into full production. The interior faces of the panels were left exposed in many areas, with a sandblast interior finish. This helped to reduce VOCs and helped meet the design goals of expressing the true materials.